This is an overview of the best tools and the best resources for building desktop applications in Python. First things first. You can build great desktop applications in Python, and some are widely used (like Dropbox). But you'll have to find your own way much more than you would using Microsoft's or Apple's SDKs. The upside is that, with a bit of legwork to package it appropriately, it's quite feasible to write a Python application that works on all the major platforms. The first thing you'll need to choose is a GUI toolkit. For traditional desktop UIs, Qt is a clear winner. It's powerful, looks native on all the major platforms, and has probably the biggest community. There are two different Python bindings: PyQt is older and more mature, but it's only free if your application is open source (licensing), while PySide is newer and more permissively licensed (LGPL). I refer to the main Qt docs a lot - the C++ examples mostly translate to Python quite well - but both PyQt's and PySide's docs contain some useful information. 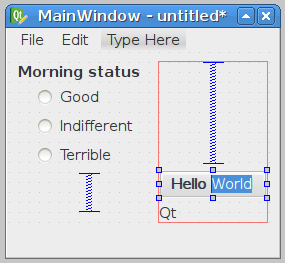 Qt Designer is a drag and drop interface to design your UI; you can compile its .ui files to Python modules with the pyuic command line tool. When you want a basic GUI and don't care about aesthetics, Tkinter is a simple option. It's installed as part of Python. Python's own tkinter documentation is rather minimal, but it links to a bunch of other resources. This site is my favourite - it hasn't been updated in years, but then neither has Tkinter (except that in Python 3, you import tkinter rather than import Tkinter). pygame is popular for building simple 2D games. There are also frameworks for 3D graphics (pyglet, Panda3d), but I don't know much about them. A couple of alternatives I wouldn't recommend unless you have a reason to prefer them: GTK is popular on Linux, but it looks ugly on other platforms. The older pygtk bindings have excellent documentation; the newer PyGObject system, which supports recent versions of GTK and Python, doesn't (though it's getting better). wx seems to have a good community, but development is slow, and new projects that could have used it now mostly seem to pick Qt. Pynsist, my own project, makes a Windows installer which installs a version of Python that you specify, and then installs your application. Unlike the other tools listed here, it doesn't try to 'freeze' your application into an exe, but makes shortcuts which launch .py files. This avoids certain kinds of bugs. cx_Freeze is a freeze tool: it makes an executable out of your application. It works on Windows, Mac and Linux, but only produces the executable for the platform you run it on (you can't make a Windows exe on Linux, for example). It can make simple packages (.msi for Windows, .dmg for Mac, .rpm for Linux), or you can feed its output into NSIS or Inno Setup to have more control over building a Windows installer. PyInstaller is similar to cx_Freeze. It doesn't yet support Python 3 (update: it does now, since October 2015), but it does have the ability to produce a 'single file' executable. py2app is a freeze tool specifically for building Mac .app bundles. py2exe is a Windows-only freeze tool. Development stopped for a long time, but at the time of writing there is some recent activity on it. Although some of the freeze tools can build Linux binaries, the preferred way to distribute software is to make a package containing just your application, which has dependencies on Python and the libraries your application uses. So your package doesn't contain everything it needs, but it tells the package manager what other pieces it needs installed. Unfortunately, the procedures for preparing these are pretty complex, and Linux distributions still don't have a common package format. The main ones are deb packages, used by Debian, Ubuntu and Mint, and rpm packages, used by Fedora and Red Hat. I don't know of a good, simple guide to packaging Python applications for either - if you find one or write one, let me know. You can get users to download and install your package, but if you want it to receive updates through the package manager, you'll need to host it in a repository. Submitting your package to the distribution's main repositories makes it easiest for users to install, but it has to meet the distro's quality standards, and you generally can't push new feature releases to people except when they upgrade the whole distribution. Some distributions offer hosting for personal repos: Ubuntu's PPAs, or Fedora's Fedorapeople repositories. You can also set up a repository on your own server. If you don't want to think about all that, just make a tarball of your application, and explain to Linux users next to the download what it requires. Threading: If your application does anything taking longer than about a tenth of a second, you should do it in a background thread, so your UI doesn't freeze up. Be sure to only interact with GUI elements from the main thread, or you can get segfaults. Python's GIL isn't a big issue here: the UI thread shouldn't need much Python processing time. Updates: Esky is a framework for updating frozen Python applications. I haven't tried it, but it looks interesting.